Academy Award winning V-Ray rendering is now available for formZ. It is integrated seamlessly into formZ so that you get instant high quality renderings "out of the box". V-Ray is a physically-based lighting, shading, and rendering toolkit. It has a wide array of features and lighting to accommodate any scene and produce top quality renders. V-Ray also employs GPU rendering to produce high quality results very quickly. Additionally, it allows you to view your scenes rendering in real-time so that you can adjust lighting and materials quickly and easily without having to do a full production render for small edits. V-Rays materials can produce very high quality results very quickly. V-Ray is integrated throughout the formZ User Interface. A suite of palettes containing tools and settings is accessible from the palettes menu. 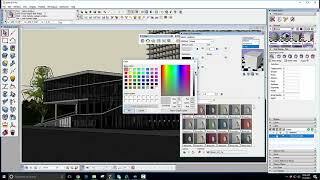 The materials interface is integrated with the formZ Material editor and the lights interface is integrated with the formZ light parameters palette. Powerful hybrid rendering You can render on NVIDIA CUDA GPUs, CPUs or a combination of both. Material library over 550 realistic physical based materials, such as glass, coated plastics or metals, wood,stone and etc. Denoiser With V-Ray‘s new denoising technology, you can automatically eliminate noise and cut render times by up to 50%! Aerial perspective Add realistic atmosphere and depth to your renders with V-Ray‘s new Aerial perspective controls. Virtual Reality Verify designs at 1:1 scale in popular VR headsets like Google Cardboard and Samsung Gear VR. Cutaways with Clipper Render sections and cutaways with ease using the V-Ray Clipper. Powerful light calculations the V-Ray Adaptive Lights algorithm will speed renders up to seven times faster on some scenes. 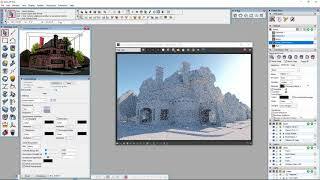 V-Ray Frame Buffer Fine-tune your renders color, exposure, and more directly in V-Rays frame buffer. Online-Lizenzierung. Für die Online-Aktivierung ist eine stabile, unterbrechungsfreie Internet-Verbindung notwendig. Bis zu 14 Tage am Stück Offline-Nutzung möglich.